Madame Nguyen Thi Nga, chairwoman of BRG Group and owner of three golf courses in Vietnam, including ownership of Nicklaus Design’s Legend Hill Golf Resort, showed her charitable side during a recent visit to Florida and Nicklaus Design’s global headquarters in North Palm Beach. Madame Nga met with Jack and Barbara Nicklaus, and made a significant donation to the Nicklaus Children’s Health Care Foundation, the nonprofit established by the Nicklauses in 2004. The mission of the Nicklaus Children’s Health Care Foundation is to provide access to world-class health care for children, and to support cutting-edge programs focused on the diagnosis, prevention and treatment of childhood diseases and disorders. 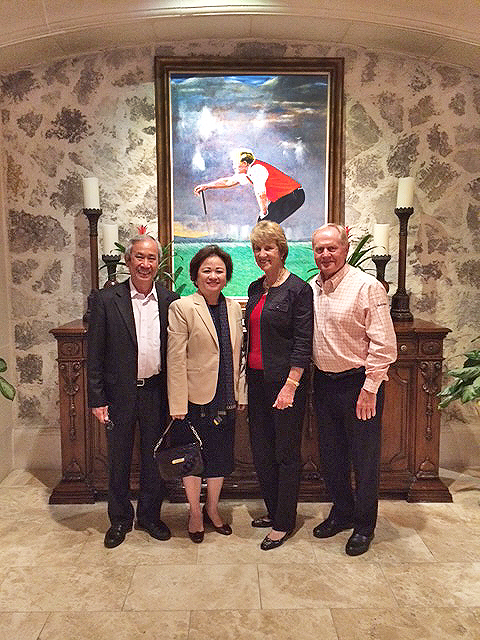 Through her donation, Madame Nga joins Mr. and Mrs. Nicklaus in their efforts to help children. Located in Hanoi, Legend Hill Golf Resort is the first golf course in Vietnam to be designed by Nicklaus Design, and is one of three golf courses owned by Madame Nga. Distinguished in the Vietnamese business world, Forbes Asia recently named Madame Nga among the top-50 Most Powerful Women in Asia. She is also a highly regarded philanthropist, known for her contribution to Vietnam’s society and economy through a range of charitable and social activities. In October, she was the only individual in the business sector to be named to the Elite Citizens of Hanoi Capital of Vietnam, where she lives and works. Legend Hill is currently under development, with a targeted opening in fall 2015. Nicklaus Design’s presence in Vietnam will extend its worldwide thumbprint to 40 countries.